The Megger DLRO200-115 measures contact resistance in high voltage circuit breakers, disconnecting switches (isolators), busbar joints, or for any other low resistance measurement. This test set accurately measures resistances ranging from 0.1 µΩ to 1 Ω, at high currents. 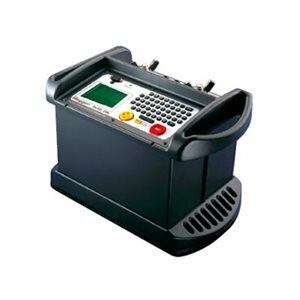 A versatile instrument, it can provide test currents from 10 A up to 200 A, subject to the load resistance and supply voltage. For those applications that demand a smooth DC current, the DLRO200-115 has extra filtering on the output to reduce mains frequency ripple and can drive 200 A through a total current loop resistance of 11 mΩ. The filtered output of the DLRO200-115 also eliminates magnetic transients that could inductively trip a breaker’s control (bus differential relay), if left in the test circuit. The unique design allows the weight and size of the DLRO200-115 to be kept to a minimum; the instrument weighs less than 32 lbs (15 kg). This small size plus a water/dust ingress rating of IP54 makes the test set equally at home in the workshop, on the production floor or in the field.